My solution to the WOOLMARK PERFORMANCE CHALLENGE was an all in one base layer suit for women skiers and snowboarders. For this unique idea I combined my knitwear expertise with my on-going interest into biomechanical and anatomical considerations. I applied my signature style of technical stitch allocation to said considerations such as: compression, heat harnessing, stretch and joint support. This has been done through the identification of high level muscle use, stretch zones and high level heat production, resulting in the need for cooling zones. The latter is not only enhanced through the performance characteristics of Merino Wool but, through WholeGarment knitting combined with mass customisation, creating base layers that are a true second skin, fitting every wearer individually, rather than a base layer that fits everybody and nobody at the same time. My idea is a spin off from my MA collection where I created separates in order to create a capsule base layer collection – the technical stitch, yarn and cell communication is a development of this knowledge. My innovative an all in one, multi-use product will serve its designed purpose of working as a second skin base layer, supporting the body during the skiing and/or snowboarding; but due to its fun and energetic design and colour way, I intend for it to be worn as a versatile product après ski, during leisure time as well as ski time. 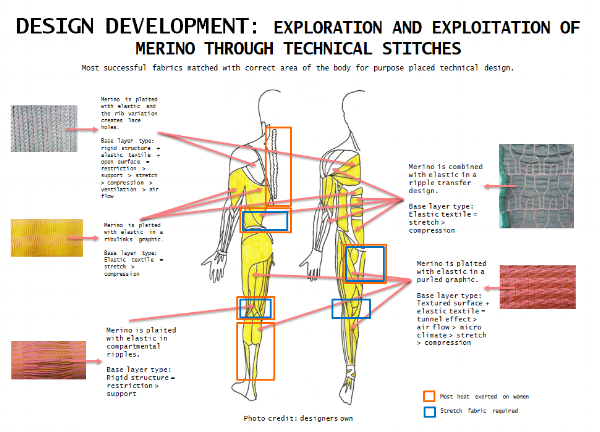 This is to highlight the performance benefits of merino wool and the combined tech stitch and anatomical interest areas, pre, during and post sport. The singlet design is an advanced development for potential future designs for additions to the collection for further creation through PhD work or starting my own brand. The all in one design was finalised as a lightweight base layer, long sleeve and full length, as the market research I conducted highlighted that this design was the most popular and in demand style from consumers. With the fashionable design combined with functional purpose, my stitch work has been inspired from my PS Scholarship to Japan where I became infatuated by the graphic and geometric designs of the Japanese staircases and buildings. The colour way chosen too is a reflection of my love for Japan with the colours being selected from various places I visited. These colours are so vibrant and energetic, but yet hold a traditional and calming element to them, which is a perfect combination for this design and its purpose. This design has allowed me to channel all my merino expertise in to a product that does not isolate merino on its own, but combines it with other performance areas of interest, with stitch and anatomy relationships. 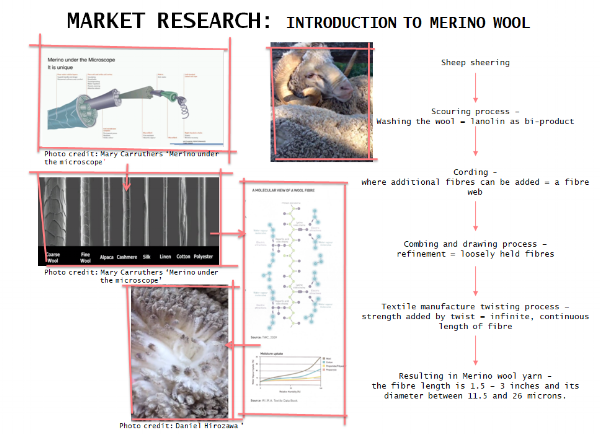 Merino wool has so many natural performance benefits but also screams out amazing sustainable benefits too. It is the most re-used and recyclable fibre on the planet. Its eco-credentials are enhanced by its long service life and suitability to be recycled, and with it being made up of keratin proteins, it makes it biodegradable. Temperature control requirement, moisture management requirement, odour resistance requirement, second skin comfort requirement, temperature regulation requirement, anti-static requirement and elasticity. All of these are perfect benefits for a second skin base layer product, especially for a skier or snowboarder, where ‘layering up’ is crucial. Why WholeGarment knit x mass customisation? The singlet will be created using Shima Seiki WholeGarment knitting machinery, combined with 3D body scanning technology. The beauty of WholeGarment is that it is seam-free technology, eliminating body abrasion of seams and additionally provide a more sustainable product; with zero waste. Products should also have a longer shelf life as there will be less wear-and-tear owing to seams bursting through rapid skiing movements. I have taken inspiration from Professor Sandy Black and Penelope Watkins’: ‘Considerate Design for Personalised Knitwear – the Knit for Fit project’. Mass customisation not only supports sustainable designing by minimizing waste, but it encourages focus on second skin fitting garments. The problem with womens average measurement garments such as S, M, L, is that they can cause ill fitting problems. Garments will rarely second skin fit 100% to everybody proportion, unless mass customisation is carried out. Specifically within base layers, if garments are ill fitting to the wearer, it can result in detrimental damage. Garments that are too tight cause continuous high levels of compression, resulting in restricted blood flow. This can result in serious internal and external damage, as processes such as vasoconstriction and vasodilatation occur within the human body during high activity. When these processes are unable to fulfil their job due to clothing restriction, it exerts pressure on the body internally and externally. Contrastingly if the garment is too loose, this causes discomfort due to bunching of fabric in areas such as joints, resulting in abrasion to the skin.